Anyone who has been paying close attention to the so-called "news" coverage around Chicago knows that no corporate media outlet is more sanctimonious (and almost in-your-face) about the preciousness of its coverage than WBEZ radio, and no time is that preciousness more annoying than during the WBEZ pledge drive. But the fact is, this year Chicago teachers can feel good about ignoring and boycotting the hypocrites who manage WBEZ instead of just screaming in the direction of those perfectly articulated consonants every time "listeners" are urged to pledge. BIG BROTHER IS TALKING TO YOU. We're talking, of course, about the regular shows with Chicago Schools Chief Executive Officer Jean-Claude Brizard, whose knowledge of Chicago and the city's public schools is limited to what he has been able to cram from spreadsheets and quickie talking point lectures since his arrival in town in May 2011 from Rochester (where, you might say, he was run out of town). Why report the news on WBEZ when you can get Brizard's bizarre version of reality one-on-one? But it's not merely that WBEZ is giving lots of free air time to a guy who comes straight from those corporate feeding pens (in Brizard's case, the Broad Foundation's "Leadership Academy"). Those corporate outfits are where corporate America fattens up future fat cats to run corporate America's version of "school reform" in any town where they can wedge them into the corner office. At the present time, you have a better chance getting an executive job in Chicago's public schools if you have a Harvard MBA than if you taught for 20 years and got your doctorate in something real in night school. No, WBEZ is also ignoring the news at the same time. The Chicago Board of Education voted on Wednesday to change its credit card policy. Under the new plan, there will now be five credit cards for the entire Chicago Public Schools system. 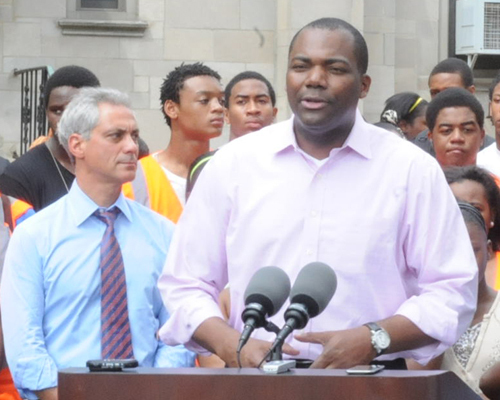 Previously, each of Chicago's 675 public schools could have up to three. The credit cards will be under the direction of the CPS chief administrative officer. In mid-September, the Board deactivated nearly 500 credit cards that had been issued to principals and other school personnel as per a new city-wide policy forcing agencies to reduce the number of issued cards to save money. In other words, if the only news from that dramatic meeting of the Chicago Board of Education came to the public from Chicago's "public" radio station, the public would know for sure that the most important thing that happened during the more than four hours the city's school board met was that the Board had cut back on the use of credit cards by its executives. A few more things happened. One was that the CEO (Jean-Claude Brizard), aided by his other CEO (Chief Education Officer Noemi Donoso) and the CIO (Chief Instruction Officer Jennifer Cheatham) presented the Board with a Power Point outline of a major overhaul of the entire system. Areas have been replaced by thingies called "Networks." Chief Area Officers are now "Chiefs of Schools." CPS has an enormous "deficit," but it's for sure getting smaller (at least according to the latest iteration — the fourth or fifth since June, when Power Point was the basis for breaking the unions' contracts). But the main story if WBEZ is credible is that CPS executives will no longer get to use CPS credit cards. Oh, and CPS has junked its policies on school closings and some other stuff that roiled the city (and destroyed communities through closings, flippings, and so-called "turnarounds" for eight years) during the "Renaissance 2010" years. Closings and other major changes are to be determined by a set of rules finally approved as law by Illinois, and Chicago was aligning its school system's rules accordingly. The one WBEZ reporter who knows anything about the schools, Linda Lutton, was not on the story. The replacement took a brief side light on the meeting and turned it into the only story. So the main story if WBEZ is credible is that CPS executives will no longer get to use CPS credit cards. WBEZ executives have also eliminated posting the audio of the entire meeting on their website (they'd been doing it for more than a year). Why should that matter? Well, as anyone who tried to view the Board's cable TV version of the meeting can attest, some things that happened at the Board meeting on September 28, 2011 came up missing by the time the Board's version of the meeting arrived at Channel 21, CAN TV, on October 1. One speaker who lied about being a teacher managed to get the lie eliminated by the time the TV version came up. Other major events from the public participation were also censored. It once was that the public could compare the WBEZ tape, which was broadcast by midnight the day of the Board meeting, with the CPS lies, which came on TV three days after the Board meeting. But for the September 28, 2011, Board meeting, the only version the public has (unless they were there or read Substance) is the version the Board is providing, with all the censorship that entails. But the main story from the Chicago Board of Education meeting — if WBEZ is credible — is that CPS executives will no longer get to use CPS credit cards. Major structural and policy issues didn't happen. The Board didn't send up some more shills to praise the "Longer School Day" so-called "Pioneers Program", posing as "teachers." Oh, and there's the matter of that half billion dollars the Board voted to borrow at its September 28 meeting. That's right, on September 28, 2011, while claiming its broke, the Chicago Board of Education voted to borrow another half billion dollars for various facilities purposes. There was no discussion of that, either, during the Board meeting, just a vote. And there has never been a discussion of how much it costs the Board to borrow amounts of money like that, in overhead fees and pinstripe patronage. But the main story — if WBEZ is credible and those heartfelt pleas for pledges are to be believed — is that CPS executives will no longer get to use CPS credit cards. You might say that the "credit card" story that WBEZ reported was kind of ironic, since the big credit card story was that CPS was going back to borrowing huge amounts of money during a year it says its "deficit" in so huge that it can't pay the raise to its unionized workers. But that's not news on WBEZ during pledge week. They've also eliminated the Thursday morning show called "Cheat Sheet" at which Linda Lutton would discuss the previous day's Board of Education meeting with "848." It seems that the owners of WBEZ have replaced the whole notion of news coverage with BIG BROTHER — the regular monopoly of Jean-Claude Brizard on WBEZ. Next time you're switching to a very loud version of Hells Bells ("I'm rolling thunder, power and rain, I come and go like a hurricane...") like some of us do as soon as those sweet "Pledge Now..." pitches come on, call a few friends instead. Tell them to join the WBEZ boycott until WBEZ's editors have decided to have some reporters cover some news from Chicago's 600 real public schools. (They've also been doing lots of charter propaganda this year). We'll keep our readers posted. A boycott of WBEZ is an excellent idea, and would promise to be much more effective than protests in front of other Chicago news outlets like ABC, etc. The reason is that WBEZ relies a lot on donations from the public, and in maintaining the veneer that they are not corporate-controlled in some way. So unions (CTU and all other Chicago-area unions) would have real access to WBEZ's jugular vein. Ditto for WTTW Channel 11. Voldemort is the evil character in the Harry Potter novels. In the earlier novels, his name is never spoken: "He who shall not be named..." is how the wizards, witches and their professors refer to him. (Later this changes, thanks to Harry and his friends, their heroism, etc.). During the 1980s and 1990s, Substance staff members were regularly quoted in the corporate media in Chicago, and we knew (still know, in many cases) all the reporters who covered the education beat because we were writing regularly about school issues for Substance and knew more people who were "boots on the ground" than anyone could fit on a Roladex. Around the time Mayor Daley took over (Amendatory Act, 1995), that ended. The editors at the Sun-Times, Tribune, and "public" radio and TV ruled that we be blacklisted from the acceptable quotables in those media. Other blacklists came later, but the first, from our colleagues in the media, was the most important. One of the funnier routes to a MA would be to research how many times Jacqueline Heard (who served as Mayor Daley's press secretary) quoted me and others from Substance during the 1980s and early 1990s, when she was a beat reporter covering schools for the Tribune. Then, one day, she became Mayor Daley's press secretary, and reporters were warned that the number of people they could quote had narrowed. An even funnier example came on WTTW, where I was once a regular "teacher" voice in opposition to the status quo. One night I was on versus Martin Koldyke, the venture capitalist who founded AUSL and other "free market" approaches to saving the public schools without lowering class sizes or supporting little things like desegregation. (At one point, Koldyke was all aflutter in favor of "small schools" until the Party Line of corporate America changed and he became against "small schools" and in favor of racist teacher bashing turnarounds and getting rid of "bad teachers..."). I always pointed out that Koldyke's premises were both racist and hypocritical. If small schools were so great, I would ask, why aren't you exporting them to Glenbard West, New Trier, and Stevenson. "Don't call me a racist..." he exclaimed. Finally one night on Chicago Tonight I laughed and pointed out that if their "free market" versions of reality were important, I should not be teaching in Chicago. With my degree from the University of Chicago, had I wanted to be a public school teacher I should have gone for the gold to someplace like New Trier or Glenbard West (that was before I was blacklisted). There, I would have had an easier working career and I would have retired with a lifetime pension much higher than I ever would earn in Chicago. I noted, on camera, that my estimate was that my choice to teach in Chicago's inner city high schools will have cost me about a quarter million dollars in salary and benefits during my working career and more than that over any retirement (since my pension would be based on the higher suburban salary were I to have worked with the children of privilege in Winnetka or Lincolnshire, rather than in Chicago's segregated inner city high schools). "It's basically the market..." I was pointing out, since these Ayn Rand zealots, even then, were preaching the same nonsensical versions of market theology that has brought the USA into repeated crises during the past 14 years. (By the way, these guys are not classical capitalists; their version of reality has nothing to do with Adam Smith and the classical traditions, but with the crazy theological prescriptions of that oversexed cult leader, Ayn Rand and her disciples like Alan Greenspan). Anyway, that was my last time on camera at "public TV" in Chicago. Elizabeth Brackett was highly displeased. And, after all, Koldyke was on their Board, not me. Since then, they've been sanitizing and censoring the people who are allowed to speak about such things as Chicago's public schools more and more. Chicago's sanctimonious pundits and pontificators would probably be horrified were they called out on the fact that they are promoting a McCarthyite blacklist, but the facts speak for themselves. They've subordinated themselves to the corporate agenda for so long that it comes as second nature: their own little Joe McCarthies are inside their own minds. And since I've been formally blacklisted from teaching in public schools as well (following my heresy of publishing Paul Vallas's ridiculous CASE tests in the January 1999 issue of Substance, after the test were given), they would be loathe to admit, even in the confessional, that they were part and party to a Blacklist. Horror of horrors! Not all the surviving corporate media hacks, editors and owners are that craven, of course. As they said about the Germans in Germany 60 years ago: "Not all. Just the majority." And of course there are a handful of reporters who have had fun with all this since then. By far, the most exciting to read is my friend Ben Joravsky of the Reader. He's written fearlessly and truthfully about the public schools and the machination of the Daley years even as most of our colleagues have cowered in fear and trembling. Rob Tomsho of the Wall Street Journal did that interesting Page One story on our fight over the CASE tests in May 2001, proving, once again, that the ruling class keeps an eye on such things, even as the local news people are fearful for their scalps in this bizarre era. And recently I had a nice time on Chicago Newsdesk. But overall, as the poet Auden wrote, we're looking back on a time like in "September 1939..."
The era of corporate media consolidation in Chicago and elsewhere has led to a betrayal of trust by the reporters and pundits who have clawed on to their jobs, holding on for dear life. They have to answer to their own children and their own images in the mirror, but somehow I have a hunch that like their predecessors, they've figured out a way to do that. Meanwhile, some of us became their Voldemorts even before the first Harry Potter book hit the best seller lists. That makes me glad I retired. I must have checked out Harry Potter books a hundred times but must confess I never had the time to read one. Also -- why doesn't CPS (or CTU for that matter) provide the audio online? It saddens me that Cheat Sheet is gone, and the new program is limited to the CEO. I'm ready to boycott BEZ. Sad that they can't do better. They certainly aren't getting any of my money. WBEZ has been lame since the mgmt abused and fired Larry Smith (rip). So what do you expect. The democrats have taken over the grassroots progressive movement. Witness the masterful co-opting of the group (and subsequent betrayal naturally) by Obama. Who do you think he learned from? da new mayor and crew. So invite the progressive dork mgmt from BEZ to some Important city events, bring them on the 'inside' giving them access to the city Overlords, both of which might help to ameliorate their woeful public radio salaries, ...and watch how fast they turn into lapdogs of the State (um..or City).